Inder Loves Folk Art: Still on the hunt for the perfect mu'u mu'u. You may recall that I am a fan of mu'u mu'us and artist's smock-like dresses. They are wonderfully comfortable and breezy, and contrary to popular belief, a mumu can be flattering if the gathers are in the right place and you cinch it with a belt and wear amazing boots or sandals. They look even better if you have a short, dark bouffant and you're sipping on iced tea. Note: Mumus do not look quite as sophisticated if your hair is in rollers, you are wearing bedroom slippers, or you have a clay skin masque on your face. You have to rock the trailer-chic, not move into the trailer park (nothing wrong with mobile home parks, mind you - they provide affordable housing to some of society's neediest - but they aren't known as centers of high fashion). When I first saw this pattern, I thought the woman on the left was lighting up a cigarrette, and I thought, "Oh, that is the most edgy and self-destructive sewing pattern I've ever seen. I must have it." But it's tea. So I'm still on the lookout for the edgiest, most self-destructive sewing pattern ever. 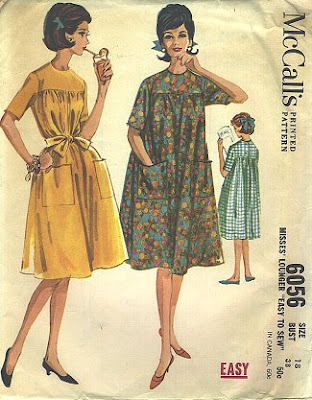 Meanwhile, this lovely pattern will be arriving in the mail in a few days from Best Vintage Patterns. I'll probably just hold onto it for camp value, but you never know, you might see me around town in it sometime.